...the apartment was not as advertised! First we arrived to Hong Kong late at night, only to discover that we were completely locked out of the apartment, through no fault of our own. 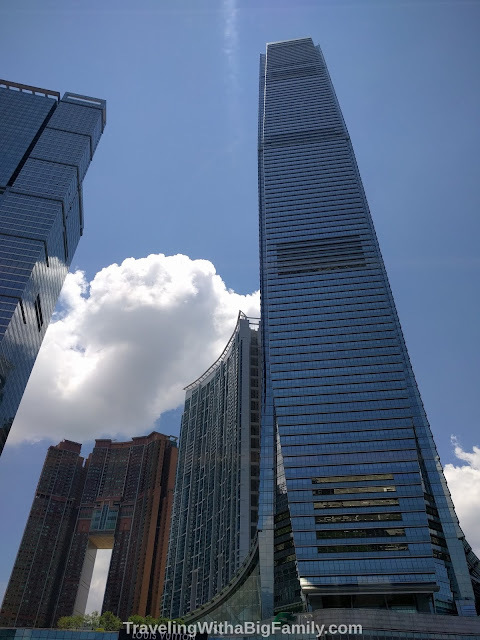 To make matters worse, the host couldn't help at all because, as she revealed once the problem arose, she lived hundreds of miles away (more on that in Part I - check out our post "When Things Go Wrong, Hong Kong Edition: 4 Tips on What to Do if You Get Locked Out," which is located here). After all that, we finally got indoors through the much-appreciated efforts of several helpful passersby, only to discover that there were additional problems with the apartment! In many ways, the apartment was not as advertised. It was definitely the same apartment as shown in the pictures in the online listing, however, the pictures must have been taken when the apartment was very clean, and probably way back when it was ready for its first-ever rental. Instead, the scene we discovered had multiple surprises. When we arrived, we were exhausted from a day of travel between Thailand and Hong Kong. We sorely needed to get showers, wash a load or two of clothes, eat a snack, brush our teeth, and collapse into bed. In the internet photos of the apartment, the high ceilings are prominent, and the apartment appears spacious and airy, by Hong Kong standards. By U.S. standards, it would be considered "an efficiency" apartment - slightly smaller than a one bedroom place, in the sense that there is no separate bedroom; the living room and bedroom is all one space. This place had 3 beds and a single chair packed into one big room, and there was still enough room to walk around inside. As far as a way to dry clothes, I already knew there would be no balcony or outdoor area where clothes could be dried in the sunlight, but the advertisement said there was a clothes washer and dryer. This was one of the very few six-person apartments advertised in Hong Kong that came with a clothes dryer. Oh, sorry!! I will speaking sternly on my helper who clean the apartment while I am away. I am sent her a message to take care of the sheets tomorrow. For tonight, please just push sheets out of way, ok? I really suspect that every guest faces this same issue, of arriving to find the apartment is half-full of wet things from the previous guests who only checked out a few hours prior, for the reasons I'll explain below. "Wait. This place comes with a dryer! Why don't we just throw them in the dryer?" The advertisement for the apartment had specified that it included a clothes washer and clothes dryer. When traveling with a big family, the ability to do laundry every day is essential to packing lightly. We were excited about the convenience this would mean for our brief visit to Hong Kong. However, as we were quickly learning while traveling through Southeast Asia, not all dryers are created equal (more on that in this prior post). In some cases a "dryer" is actually just a rack for hanging clothes out to dry - and this is not necessarily going to be in a place that is outdoors, or even near any sunlight. The clothes may get dry - or not - over the course of a day...or two. In other cases, "a clothes dryer" means a machine that resembles one somewhat, but is actually a dehumidifier. Or apparently in some cases, a "clothes dryer" means simply a whole-room dehumidifier. I looked around the apartment and saw that there was no clothes dryer like what we thought had been advertised. The only possible means of ever drying sheets and towels, or anything else, would be to hang them from the ceiling clotheslines, then run the provided whole-room dehumidifier all night (in the room where we would be sleeping). Drying a bunch of very large items like these would take 12 to 24 hours. Since this place specifically advertises the fact that they change the sheets between guests (I guess that means other places don't? ), and this is the only way they can dry sheets, I take that to mean that every time a new set of guests arrive, they are surprised to find wet sheets and towels hanging all over the apartment. Having this all take place in the apartment's one large room also meant that as we slept, the dehumidifier would be dehumidifying us as well - our skin, our nasal passages, etc. I considered turning it off and hoping the sheets would get somewhat dry anyway, but then we'd have the evaporation from the sheets over-humidifying the whole place, so that wouldn't work. So - no big deal - we would not be tossing our clothes into a machine that uses motion and heat to dry clothes in 45 minutes or less. Instead we would be hanging our clothes on the several clotheslines located all over the ceiling of the apartment, then running a dehumidifier for perhaps 12 hours or more. We were planning to see Hong Kong during the day, not hang around to empty the dehumidifier three times a day. With some planning, I figured we could get some clothes done, sometimes. As in Bangkok (where our dryer took 10 hours to get the clothes partially dry), I'd have to give up some sleep each night, in order to get up and fiddle around with the machine, 2 or 3 times per night. That night, we were arriving from Thailand, ready to do a load of clothes and to get them dry for the next day, but since there were dozens of wet items already displayed all over the apartment, it wasn't going to be possible to wash all of what we needed to wash. There would be nowhere to hang out our clothes to dry, because the apartment was covered in wet sheets from the prior guests. Fortunately we were all traveling with some items that are fast-drying. A quick hand wash in the sink for those clothes, and we hung them out for what was left of one night, and they were bone dry the next morning - even though the sheets were still damp. One of the features of this apartment that most appealed to me was the host's emphasis on cleanliness, in her listing. She mentioned it over and over again, even using "Super Clean" in the title of her listing. I was impressed by the fact that she specified in her listing that she expected her guests to treat the apartment like it was their own home, and she asked that guests please avoid making it dirty, because she lives there and she expects it to be clean. I thought: Wow, this place will be immaculate. Maybe I'm just picky, but seeing 20 or more large items of wet laundry from the prior guests, and having that block our walking paths into and through every part of the apartment, didn't exactly set the tone for deeming the place to be "Super Clean." She mentioned in her ad how she does a thorough cleaning job after every guest, with all towels, sheets, and blankets washed (we could see that part had been done, that's for sure), all floors scrubbed, all counters scrubbed, sink cleaned, bathroom cleaned, and so on. And truly, in the photos, it was probably the cleanest-looking Hong Kong apartment I saw online, out of at least several dozen that I carefully considered before choosing hers. She put the camera right down on the floor for some pics, so you could even see the floor shining. After being inside the place for an hour, we could tell: it had been cleaned...sure, sure. Sort of. Someone had been there. But it had been at least several years since it had a good, thorough scrubbing. Here and there you could see caked-on crud that had various textures and colors. The tiled floor in the bathroom wasn't something you'd want your kids to stand on. There was crud and scummy stuff here and there in the kitchen/bathroom. It was somehow clean, but not clean, at the same time. Like a lollipop that gets dropped on the carpet. At first you think: that's not so bad. Then you notice the hairs stuck to it. It just wasn't the sort of place where you would want to accidentally touch the walls. Or the floor. These were the biggest roaches we had ever seen. I'm talking about roaches like out of a Calvin & Hobbes nightmare. I'm talking about roaches that probably answered to the name of Gregor. These things weren't even afraid of us. They had this attitude like, "What are you doing in my apartment?" I mean these roaches made you feel that you were intruding. When they noticed you, they just kind of slowly turned their feelers towards you, waggled them around, then turned the other way in a very haughty manner (like an arrogant cat might) and showed you that you really weren't worth their attention. Roaches everywhere in Hong Kong. Food markets also restaurants nearby everywhere, this make roaches everywhere in all apartment whole city. But no problem, check bathroom. There is bug spray! A quick search of the bathroom revealed two huge canisters of powerful-looking roach spray right above the food preparation counter (the bathroom was also the kitchen, and laundry). "We have roach spray!" I announced to the family, who was afraid to sit down anywhere. These children were about as tired as they have ever been, and yet, they were all still standing. My announcement about roach spray was premature. One can was totally empty, while the other was nearly empty - about one squirt left - possibly as much as two. So I had a decision to make: when and where would we most prefer not to have these Volkswagen-sized roaches on our skin? Perhaps...while dining at the one-person breakfast nook? Or perhaps while naked in the phonebooth-sized bathroom/shower area? Or perhaps whilst asleep in bed? Two squirts, for six roaches that we knew of (so far!). Hmmm. So, yep, it turned out, I'd be making a midnight run to a local 24-hour convenience store to buy our very first Hong Kong necessity: roach spray! But first, would there be anything else we needed to buy before we could shower and collapse into bed? One thing about a multi-country international trip with a big family is that toiletries are always an issue. You get things confiscated at the airport if they are too big (bigger than 3.4 ounces, or 100 mL each). You are six people so you need several types of things - toothpastes, shampoos, deodorants, hand sanitizers, sunblocks, all sorts of little potions and things. My wife always has one or two kinds of rehydrating hand cream for after the airplane rides. Kids pop up with one or two things that might count as a liquid or gel - chapstick, etc. For our family of six, the liquids require careful planning (What kind of shampoo does our oldest son use? Can he use the same kind as our daughter? No? But why not? Oh. I see. Ok, fine, so we have to pack two kinds, not a big deal. Wait, we need three kinds? Why?). Then whatever actually makes it onto the packing list has to be purchased and packed properly. This means getting it all to fit into zippered Ziploc bags, no bigger than quart size, and limited to one per person. On most trips we have enough liquids that we can nearly fill one of our six backpacks. And the liquids are heavy, considering that when it's something you'll be carrying on your back, every ounce counts. 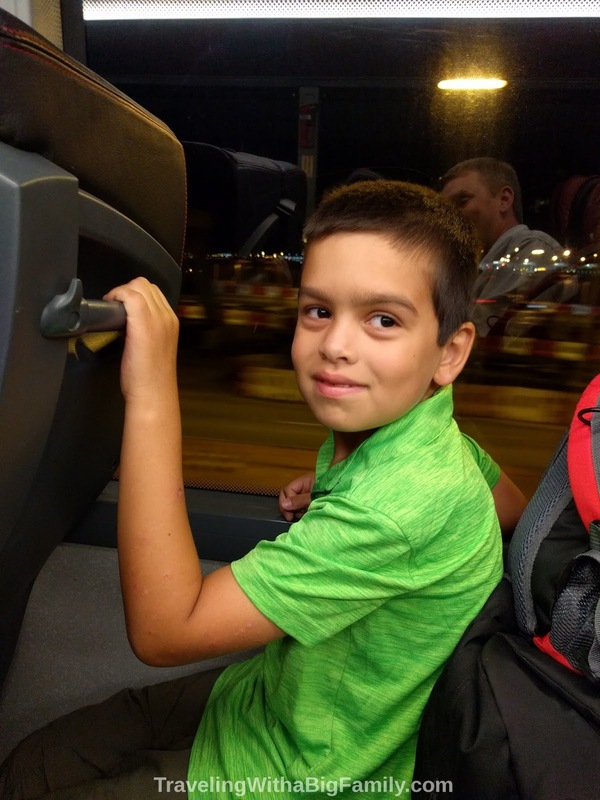 We don't check any baggage - we travel with one backpack per person, so, whatever we bring on a trip, we lug around with us through the airports and airplanes. By the time we got to Hong Kong, we had been on the road for almost 3 weeks, so our supplies from home were, for the most part, gone. So, in reviewing dozens of Hong Kong apartments, one of the features that caught my eye was the offer of several kinds of free toiletries. In the pictures, you saw 4 kinds of shampoo flavors left out for guests. There were 3 kinds of toothpaste (Crest, Colgate, Charlie). There was dental floss, and so on. Now, those things could be purchased for a few bucks somewhere, but first you'd have to locate a store, get to it, find the items, read the labels - possibly in Chinese - then buy them, and carry them back to the apartment. I mean, just locating and buying one such necessity on your first day of arrival in a new country can be an adventure all by itself (more on that here). And then, if you're flying out of the country three days later, most of what you buy will end up being discarded or confiscated by airport security anyway! So, while it may seem like a trivially small matter, having some basic toiletries included as part of a rental can actually be quite a lovely convenience for a big family. I thought this was going to be a great feature for this apartment. A full-size set of shampoos and toothpastes and so on would be more than enough for our 3 nights, and we wouldn't have to go buy anything that would end up getting thrown out. We actually planned our Thailand to Hong Kong packing based on these free toiletries, knowing that we wouldn't need to purchase any toiletries until after we left Hong Kong. I knew we'd be arriving to Hong Kong late in the evening, and that having some toothpaste and shampoo and a few things like that provided would be very, very handy. Plus, the online images of the toiletries just made a good impression on me: it conveyed the idea of a thoughtful host. The rental listing had photos of lots of white, fluffy, freshly-folded towels, curling irons and hair dryers and international voltage converters, and separate images for each kind of toiletry provided. But I had to laugh when I got into the apartment's bathroom/kitchen and saw them. The free toiletries were the exact same ones that I saw in the photos. And I don't mean it was the same type of toiletries, or the same brands. I mean it was literally the actual bottles from the photos. The reason the actual, exact same bottles were still there in the apartment is that they were never replenished between guests. We had our choice of 4 kinds of mostly-empty shampoo bottles. There were 2 kinds of toothpaste in leftover, partially-flattened tubes that had been used by who knows how many guests over an unknown period of time. I had booked the apartment about three months in advance, so these toiletries had been used by nightly guests for at least that long. Or perhaps the first guests used them partially, and no one else touched them. 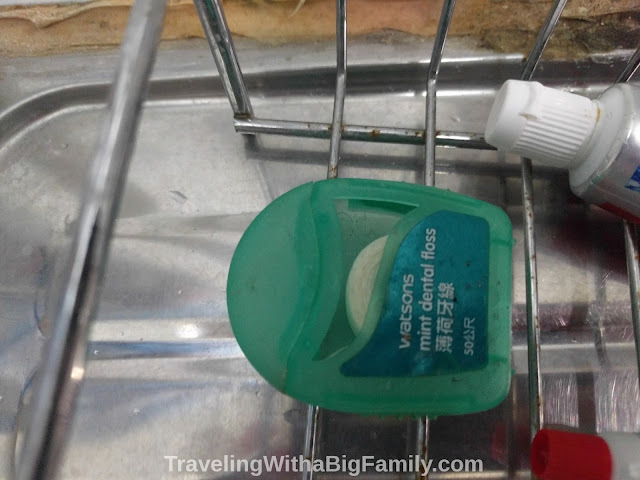 There was some dental floss, about half-gone, with mildew on the pack, laying in a wet, rusted tray by the kitchen sink/bathroom sink (the sink served both purposes). Included at no extra charge: free (mildewed, half-used) toiletries! Now I'm sure I'm being too persnickety here, but, that mildewed, used floss container was just gross. The thoughtful host had also advertised a free breakfast - a fantastic, hotel-quality feature for a big family! We were pretty pumped about that. What do people eat for breakfast in Hong Kong anyway, we wondered? We had our money on instant noodles. The host had arranged that her cleaner had left out some breakfast items and snacks for us, as advertised, but, you guessed it: each of the items had already been partially eaten. We were provided a box of dry breakfast cereal - some Fruity Rings flavor - but it was in an open box that wasn't closed; both box and bag were open to the air. There was also a package of imported English Muffins - a six-pack, perfect for us! But with only two muffins left. This, too, was in an open container, exposed to the visits of the bugs. I touched these foods just long enough to roll down the bags and close the boxes, and was surprised to find that none of the behemoth roaches were hanging out inside the food boxes. Perhaps they had already had their fill for the night. Yes, I recognize the irony of my litany of complaints about this apartment. I'm privileged to be able to travel with my family internationally. 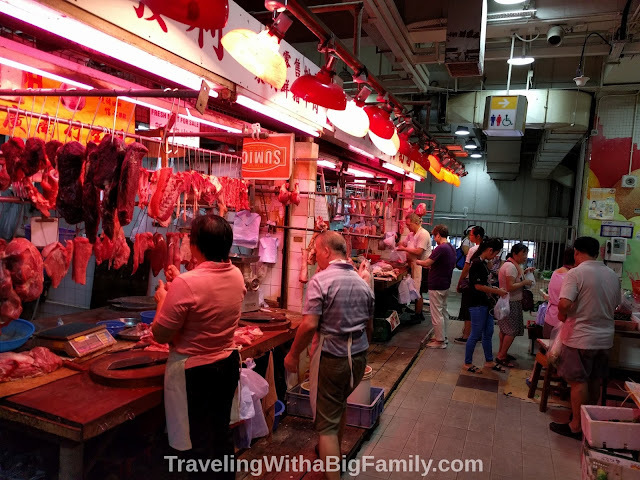 We loved Hong Kong - really! And we made the best of this apartment, taking nearly all of it in stride. Not having toothpaste provided? I mean, big fat deal, right? It was nothing. I already had a need to make a midnight run to a store anyway, because of all the roaches. We didn't even mention the used toiletries or the open food to the host, nor anything about cleanliness other than the presence of a squadron of cockroaches. We only bothered her about that one time she kept us locked outside on the street for an hour, and about the apartment being chock full of wet sheets, and we very briefly mentioned the roaches, just in passing. This post might make us sound like difficult guests, but really, after a few texts with the host that first night, we didn't reach out to her again except to thank her when we checked out. She got a positive review from us, with a fair description of pro's and con's. I really don't know if we actually could have found a better apartment elsewhere in Hong Kong - almost certainly not in that price range! So I shouldn't complain about trivial details. I'm just writing this article to share the experience with you, because the things we learned may apply in all sorts of situations, where an apartment is not as advertised. You may find, as we did, one time in a different country, that the advertised presence of electricity isn't as promised. You may find that an apartment is unsafe, or located in a neighborhood where you don't want to go outside in the nighttime or daytime. There are definitely worse things than finding out that somebody already ate all your Froot Loops. A much more important matter is staying in a safe neighborhood. So far we've been able to weed out all apartments in unsafe neighborhoods, or in areas that are not family-friendly. For more on how we choose a neighborhood for our big family to stay when traveling, check out this prior post. 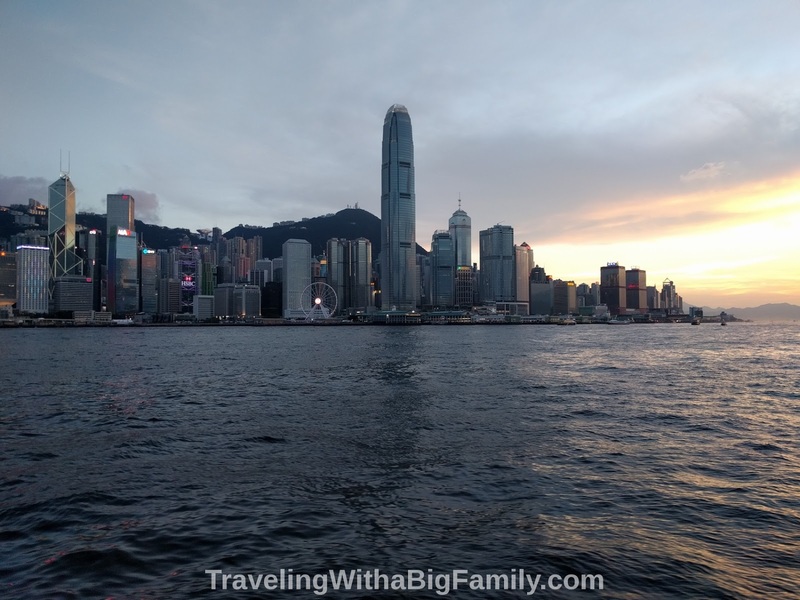 We truly enjoyed our time in Hong Kong (see our tips for visiting with a big family here). And, despite all the minor problems in this apartment, we would almost consider staying at this same rental again! Ask About Clothes Dryers. If the advertisement says a dryer is one of the features, don't take that for granted. All the host did was click on a box in a multiple-choice list of features. It's not as though the American website offering the listing has sub-choices to allow a host to specify whether they mean a Western-style clothes dryer, or some form of dehumidifier or other alternative instead. Just ask the host: is the clothes dryer a drying rack or clothesline? Is it a motion machine only, or does it also use heat? Is it a whole-room dehumidifier located in your bedroom? Alternatively, is there a public laundromat nearby, in case your big family is on a short visit and just doesn't have 12 hours to wait for clothes to dry? For more tips on dealing with laundry in another country, see our full post. Document It. If you need to contact a rental host about any issues with the property, do it on the platform through which you rented the apartment or home. Take pictures of the wet sheets, and the grapefruit-sized cockroaches. This is the only way there is any accountability for the host's response time and ability (or inability) to solve problems. It's the only way to have any proof that you even contacted the host. If you need to document something, send pictures to the host via the rental platform, so the company that operates the rental platform can see the pics too, if the need should arise later. Local Hosts. When possible, choose apartments that have a local host who lives in the same city as the rental. If an urgent problem arises, you will want the host to be close enough that the host is willing and able to deal with it. Staying with someone who lives 1,000 miles away from your rental makes certain types of help impossible. Not everything can be accomplished by text. Arrival Time. 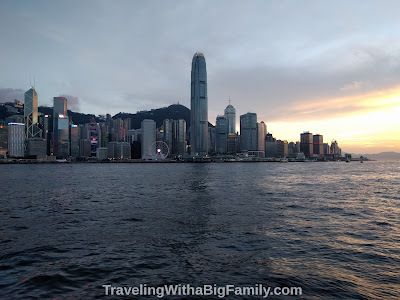 Never intentionally arrive after dark when traveling with a big family to a new location (read about the Perfect Arrival Time in this post). Arriving in the early afternoon to find these issues would have made for a very different experience than what we had, because we arrived way too late at night. Flexibility. Always have a time cushion in your travel plans for the possibility that things might go wrong or not be as advertised. It's always possible that you might find serious, incurable issues (lack of electricity, or the water doesn't work, etc.) that could prompt you to ditch the apartment and head to a hotel. We're much less likely to want to make that move if it's already past midnight. Hello, and thank you for reading! Glad to hear you'll be back, and thanks for your comments!